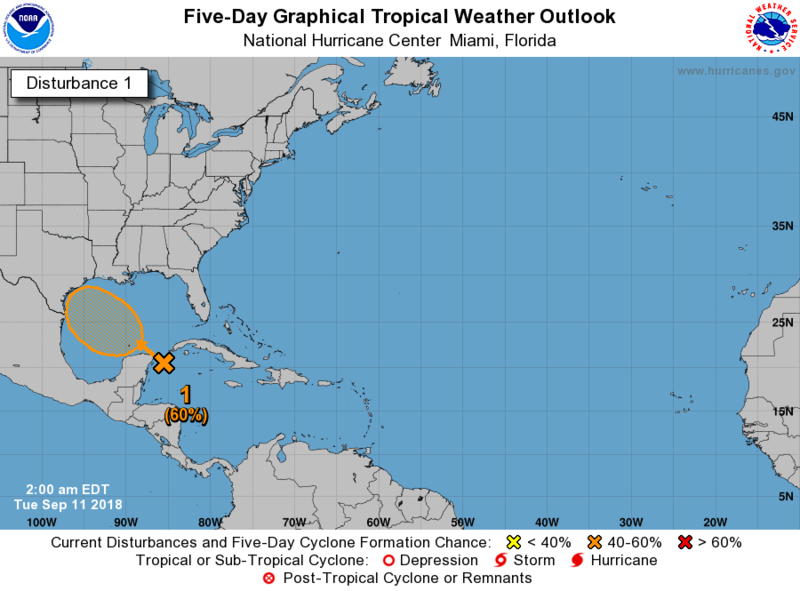 The National Hurricane Center, as of 5:30 CT this morning, is giving Invest 95L, our Caribbean disturbance a 60% chance of developing as it moves across the Gulf this week toward Texas. Overnight weather modeling did nothing at all to increase our concern over this system, as no reliable models shows this developing into anything more than perhaps a depression or weak tropical storm. There’s always a “but,” right? If you look at Invest 95L this morning on satellite, what stands out? From a meteorologist’s perspective, I see two things. First, a lack of organization. Invest 95L isn’t quite ready for primetime yet, and hopefully it never is. Second is the substantial amount thunderstorms associated with it. This disturbance will be carrying a lot of moisture as it comes across the Gulf. So whether it develops into a formally defined tropical depression or tropical storm, it will have heavy rainfall along and north of its track. So where is that track? Well, rainfall forecasts are difficult to parse out at this point because we have a bunch of rain in the near-term that isn’t associated with 95L. If you look at the current NWS forecast for rainfall from Friday morning through Saturday morning, you can see the footprint of 95L staying primarily to our south. So at this point, we expect Invest 95L to track far enough south to keep the heaviest rain south of Houston. That being said, this is a four day forecast for a tropical disturbance without a center. This could change. For now, I would expect scattered showers and thunderstorms with locally heavy downpours both Friday and Saturday as Invest 95L works into South Texas. We will update you with the latest later today. We finally may have a chance to turn off the faucet on Sunday and Monday. We’ll see. A quick update on the rest of the tropics. 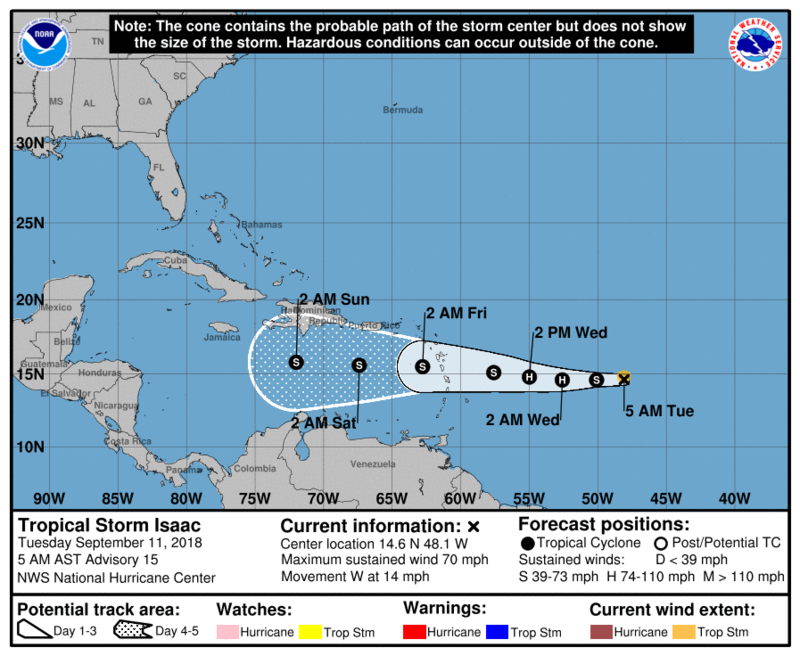 Isaac has been downgraded to a tropical storm, where it is expected to stay for the next three to five days as it moves into the Caribbean. Is Isaac something for us to watch? Yes, as we would anything in the Caribbean this time of year. But the good news is that almost all reliable weather modeling keeps Isaac going west into Central America or basically falling apart in the Caribbean. So no reliable models show a threat to Houston or Texas at this time. But we will continue to watch it closely. Florence continues to see intensity fluctuations and is presently a Category 4 hurricane with 140 mph maximum sustained winds. There’s been no good news in the last 24 hours with regard to Florence’s possible impacts on the Southeast U.S. There has been a subtle southwest-ward shift in some modeling, perhaps in part due to Invest 95L influencing the upper pattern over the Southeast. This puts more of southern North Carolina and northern South Carolina at greater risk for significant hurricane impacts. Florence continues to show all signs that it’s going to get cut off from any steering currents over the Carolinas. This will allow copious amounts of rain to fall somewhere between Virginia and South Carolina, depending on the stall. 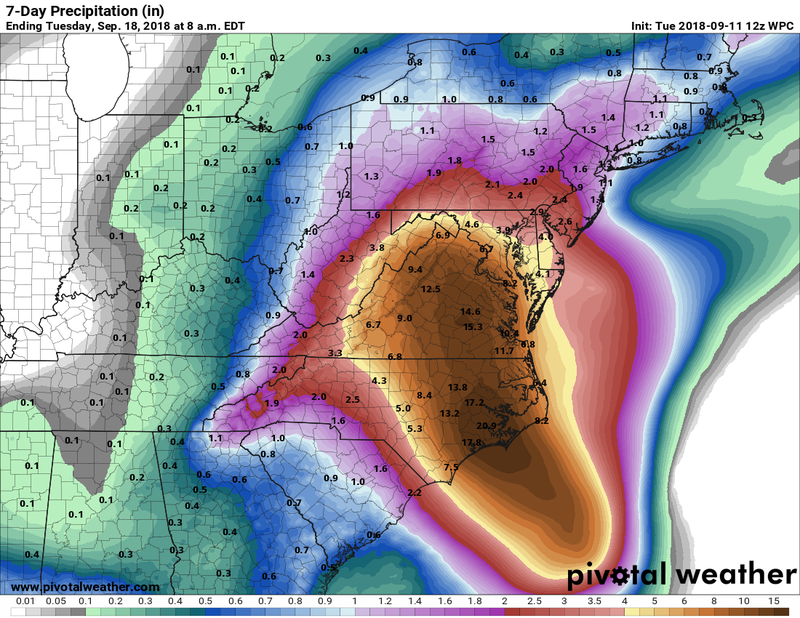 The current rainfall forecast has escalated further for this region, with the official forecast showing a 20″+ bullseye in eastern North Carolina. 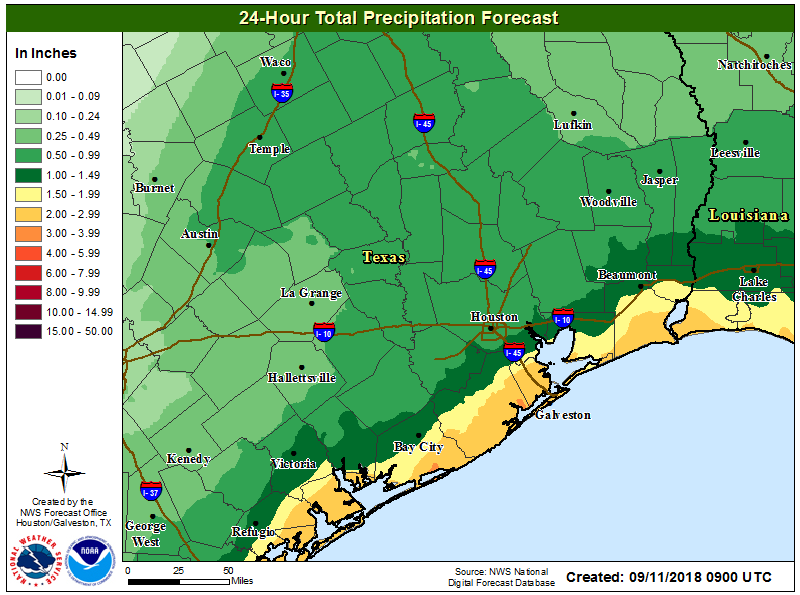 This means someone is likely to see higher amounts as well, perhaps closer to 25-30″ of rain. While the exact details of the track and rainfall map will change in the next day or two, we know that this is going to be a really bad storm somewhere in the Carolinas and/or Virginia. Our thoughts are with folks in that part of the country, as we know all too well what a storm like this can do. We will have more for you a little later today. I think one of you said this weekend that every storm in the past that has been on Florence’s path has turned north. What’s different this time that’s making it run full steam ahead into the east coast? Sort of what Tim offered. It’s a really unique pattern where Florence had the typical chance to get picked up and turned back out to sea. But because of high pressure aloft (20,000′ up) strengthening basically just northeast of Bermuda, it’s not only blocking Florence’s exit, it’s helping to push it toward the Carolina coast. Once it gets to the Carolinas, the cruel irony is that if the high pressure could keep strengthening and pushing Florence, it would keep moving inland toward Kentucky and Tennessee. But because the high pressure weakens and falls apart, Florence basically gets cut off from a lot of steering currents and ends up stuck to meander until something can pick it up or bully it out of the picture. That may not occur til Monday. What’s the historical average for the arrival of the first cold front that feels like a front – you know dry air for half a day and a nice cool overnight temp? We’re getting close to when we should be seeing one. Our first sub-65 degree low in Houston, on average, is September 14th and our first night in the 50s is typically September 26th. We’ll see if we can get something by the 26th, but I don’t see much chance for anything like that through at least 9/20 though as of now. Thank you Matt for your comforting words this morning! I awoke to the sounds of my dear Fulgencio in tears and soon realized he was watching The Weather Channel and they were scaring him with all of the talk of the rains in Texas coming. Hoping for the best to all in hurricane paths! Armando, Please help dear Fulgencio understand that the Weather Channel is FAKE NEWS! Ancient Aliens can give a more accurate weather report!! In fact they likely have more scientists on staff than the Weather Channel! I don’t like that they are praying on the sensitive nature of dear Fulgencio! If they told the truth like Matt and Eric the viewership would come!!! Ancient Astronaut theorists say it’s Aliens. Definitely Aliens. I frequently see weather reports state “south” or “north” of I-59 corridor, or in your case today, “southeast”….if 59 runs north and south, what does this mean? I haven’t found anyone be that can explain it. Why aren’t the predictions east or west? South of downtown, 59 / 69 turns and runs east – west. US-59 runs northeast to southwest from Houston to Victoria and generally north-south from Houston up toward Cleveland. So it gets messy. You’d have to look at a map of Houston to see this visually better, but when you do, you’ll understand. Assume “southeast” to mean “south” in other reports. The beauty (or horror) of a system that doesn’t have a closed center to track… while the track is still that whatever, if anything, develops of Invest 95L (TS Joyce?) goes tracks south of us, the ellipse is now a little bit more toward Victoria and Port Lavaca than it is Corpus and Rockport. Let’s hope this turns into just a rainmaker, but there’s no such thing as certainty with this low pressure system. I have a feeling it’ll officially be a TD tomorrow afternoon and a TS by Friday morning (just before it makes landfall). So what are the steering currents for 95L if it should come ashore along the lower Texas coast? Will it move inland towards northern Mexico or pulled to the north and east. It should move into the Rio Grande Valley. It won’t be in a hurry, but it should keep moving steadily. It is raining pretty steady here in Bacliff and San Leon. Streets and parking lots are beginning to flood. 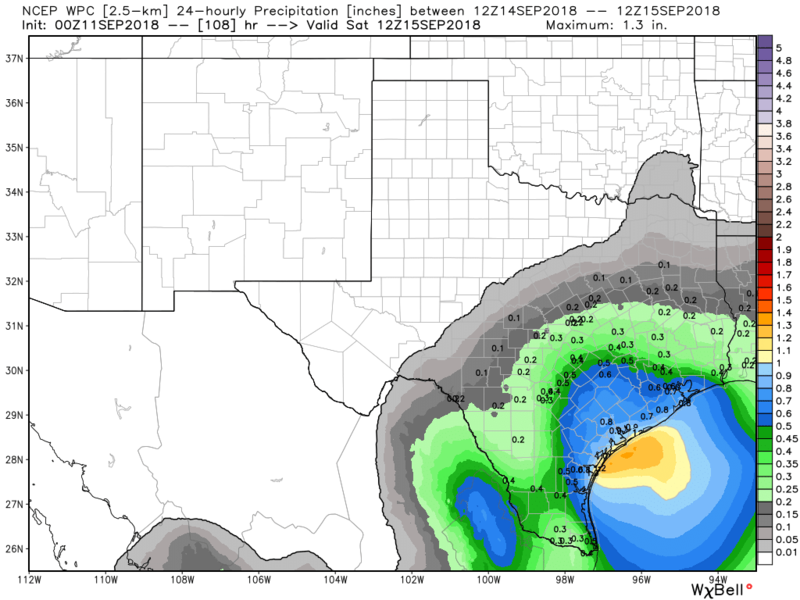 Sounds like a disorganized system to our south could bring a lot more rain to Houston than an organized system that stays more compact. I’m not sure what the better scenario is for us. Neither scenario is optimal, but if I had to pick, I’m going to take the discombobulated one. Not terribly worried about a massive rain event here right now. Yes, some heavy rain possible, but we’ll see if it stays mostly south. Geez. But really, when might we hear of artic blasts blowing down from Canada to put an end to this season? I know it’s out of your jurisdiction but… heading to San Antonio from Thurs-Sat. Quick weather outlook? Is 95L bringing the rain there? Thanks for all the work. Thanks for the calm in the storm. I have given your website URL to many here at work and told them that yours is the most reliable without the frenzy of TV weather reporting. My wedding is Saturday in Austin. I’m worried about family flying in from the east coast. I’m not sure how these storms may impact the Austin area? You kept me calm through Harvey and maybe you can do it again! 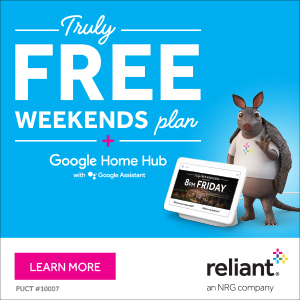 I think that you will be able to get them into Austin without issues here (yes, it might rain or storm, but nothing we shouldn’t be able to handle in Texas). Just make sure they’re patient…there are ripple effects due to Florence that may be felt in airports not impacted by Florence. And hoping for a dry one for you…though rain on your wedding day is good luck after all…so no sweat! 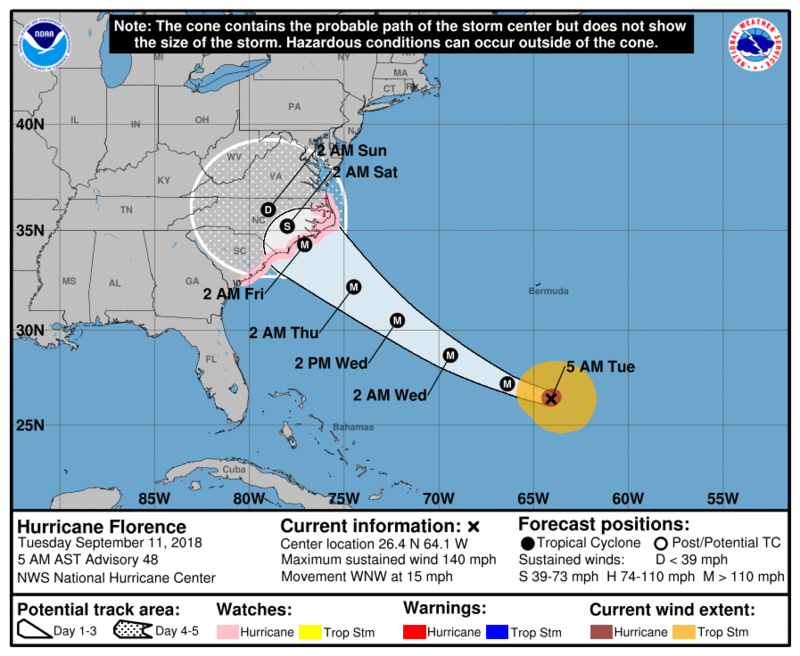 Florence’s (ice cream) cone of uncertainty. There’s been no change since this morning. If anything, it looks more like a Corpus issue than a Houston one. I will be posting a quick update soon though. Have you seen any of the latest runs for Isaac? Could it be trouble? An Ike track? Hi Eric– I read the wonderful article about you in Wired a while back, and am now looking at your site as Florence approaches for some legitimate advice/findings. I just moved to Raleigh-Durham area and everyone here seems very chill and preparing as they have for past hurricanes. We live in a two story house along a creek that lets off water from a nearby (neighborhood) lake. I know this area is pretty well prepared for these, but my big question is if we should leave (they haven’t evacuated anyone here yet) or stay put with our food and water, inside. This is a vague piece of context, but if you have any thoughts they would be greatly appreciated. 🙂 thanks in advance!